I cut the lawn today and I am hoping it is the last time this year that I have to do that. I wanted to make sure the lawn was nice, neat and tidy before the onslaught of Fall leaves hits! I have two beautiful young Oak trees in the backyard that promise to give me a few good workouts this Fall! Then I spied that Tupperware container half full of Rice Krispies…and just this morning I had seen a bag of ‘mallows in the pantry….yup, I am going to make up some Rice Krisipie Squares…well, Treats as I didn’t make them in the conventional 9×13 baking pan; instead I got out my trusty Classic Tupperware Nesting cookie cutters and chose the largest one. Next I made up the Rice Krispie treats recipe as per directed on the box…wait, I don’t have the box, I have Tupperware; no worries, google to the rescue! You see, I was even too lazy to go and look in my beautiful Recipe Box for the printed recipe I have there. Anyway, back to the treats; when stirring the cereal into the melted ‘mallows I added a fair amount (1/4 teaspoon) of Wilton Butter Yellow Food Colouring Paste, then I turned the gooey mess out onto a piece of parchment paper I had lightly sprayed with vegetable oil spray, covered it with another piece of sprayed parchment paper, took the rolling pin to it, cut into shapes, rolled the scraps into little balls which would become pumpkins, done deal! Well, then I had to decorate them. 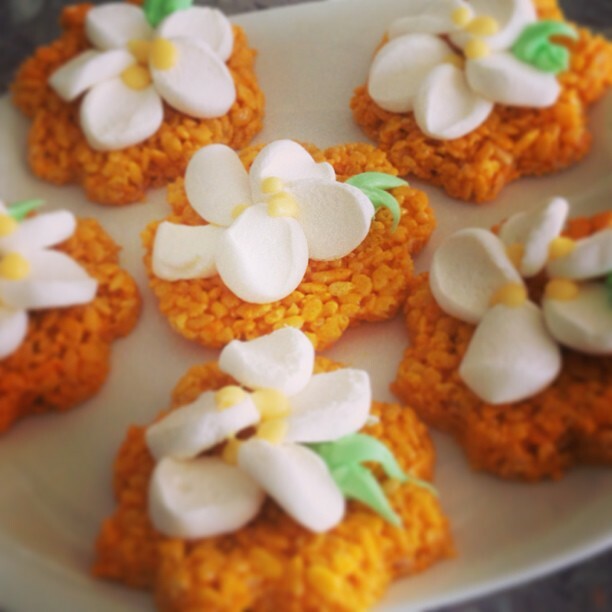 Using clean kitchen scissors I cut large ‘mallows into four bits which became the petals that decorated the Pumpkin Flowers. Then I whipped up a couple of batches of thick glaze, tinted one light yellow, the other green, loaded them into piping bags fitted with a small writing tip and piped stamen onto the white ‘mallow flowers, and using green, piped faces onto the pumpkins; changed the green writing tip to a leaf tip and piped leaves onto all. Then I had to clean up the ooey, gooey, sticky, messy pot and other dishes….should have just dragged out the mixer and made Sugar Cookies! Lightly spray (2) 21″ squares of parchment paper with vegetable oil spray; set aside. Remove from heat; stir in vanilla and yellow food colouring. Turn out onto prepared parchment paper and gently roll out to 1/2″ – 3/4″ thickness. Cut with a large cookie cutter, dipped in water. Roll scraps into various sized balls. Top each rolled ball with half a pecan, forming the stem. In a small bowl stir enough water into 1/2 cup of powdered sugar to give a semi stiff icing. Load into a piping bag fitted with a small writing tip and pipe stamen onto the centre of the flowers. 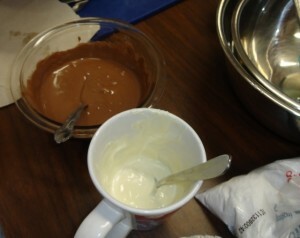 In a small bowl stir enough water into a 1/2 cup of powdered sugar to give a semi stiff icing. 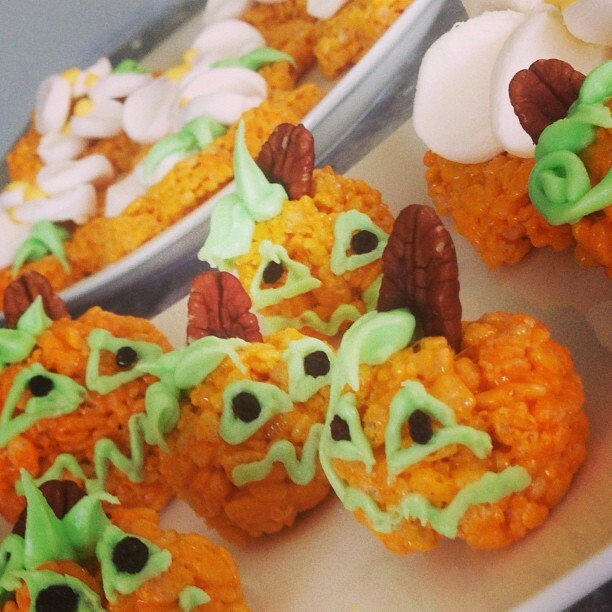 Load into a piping bag fitted with a small writing tip and pipe vines and faces onto the pumpkins. Change tip to a small leaf tip and pipe leaves onto pumpkins and flowers. Carefully place a currant in the centre of each eye. I made these on Girls Day at my school today. It was a busy activity for 25 girls to do in the space of 25 minutes in a teeny tiny room! I think everyone liked them. 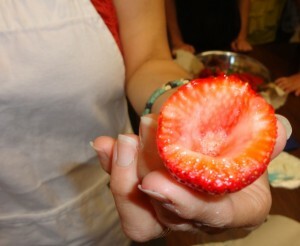 Cut around the top of the strawberry and carefully remove the centre of the berry without damaging the outer walls. Prepare all the strawberries and set aside. In a medium mixing bowl combine with a whisk the slightly softened cream cheese, icing sugar and vanilla until smooth and creamy. 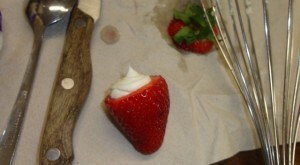 Load cream cheese mixture into a 30cm piping bag with 2mm snipped off the end. 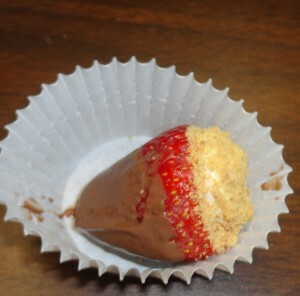 Fill each strawberry with cream cheese mixture, dip into a bowl with graham wafer crumbs to just coat the cream cheese; repeat with all the berries. 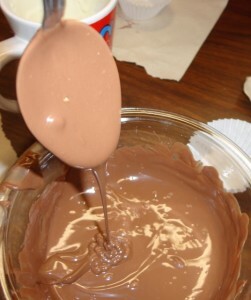 In a medium microwave proof mixing bowl melt the milk chocolate melting wafers for about 1 to 2 minutes, in 30 second increments, stirring well after each increment, until smooth. In small microwave proof bowl melt the white chocolate for about 1 minute- 1 1/2 minute, stirring after 30 seconds, until smooth; load into a 30cm piping bag with just the tip cut off. Milk Chocolate and White Chocolate, ready to go. 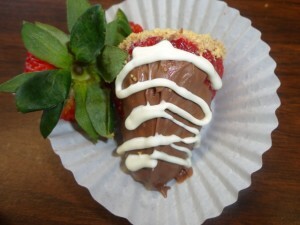 Dip each filled strawberry into the melted chocolate, place on paper lined tray and repeat with remaining berries. Pipe zig zag design over the chocolate dipped strawberries with the white chocolate filled piping bag. In heat proof glass bowl melt chocolate in microwave on Medium setting for about 2 minutes, stirring every 30 seconds. Stir in butterscotch chips and microwave for another 30 seconds; stir well until butterscotch chips are mostly melted. Stir in Parkay Noodles, ‘mallows, peanuts and cranberries. 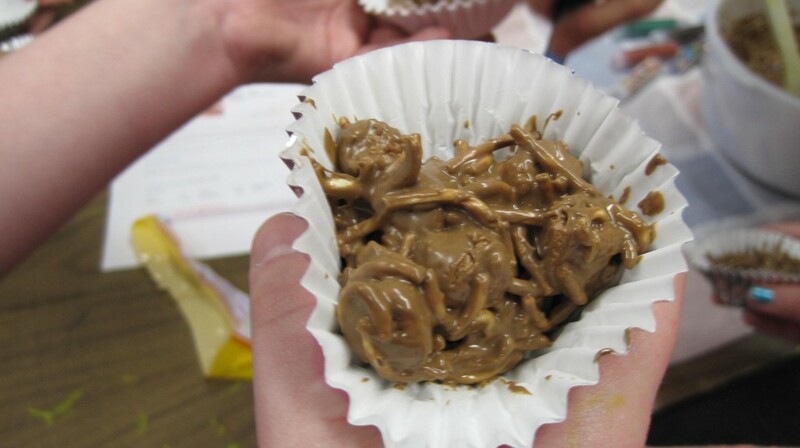 Drop heaping teaspoons of the mixture into individual paper baking cups. 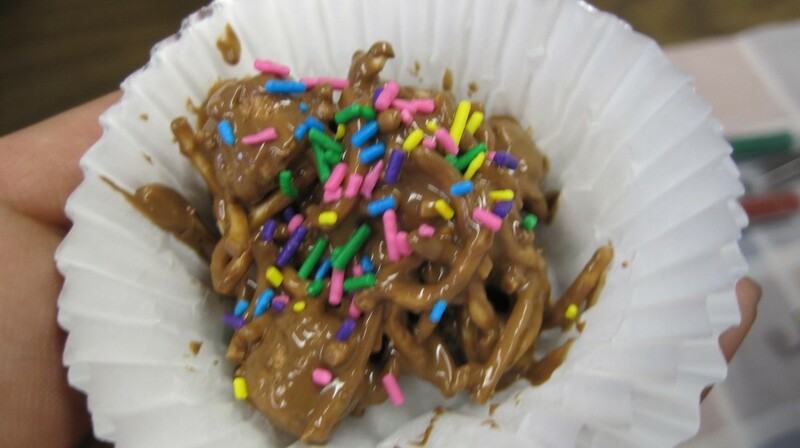 Chocolate Spiders - Ooey, Gooey Chocolatey Goodness! Combine sugar and cinnamon together in a shall bowl; set aside. In large bowl, sift together flour, sugar, salt, baking powder, cinnamon and nutmeg. Using pastry blender, cut in butter until crumbly. Stir in milk and egg until smooth. Turn out onto lightly floured surface and work in any remaining flour. Roll or pat to 1/4 inch thickness. Cut with doughnut cutter, or use two round cutters of different sizes. Carefully drop doughnuts into hot oil, a few at a time. Do not overcrowd the pan. Fry, turning once; cook for about 1 1/2 minutes on each side. While warm, coat with Cinnamon and Sugar mixture.